Who remembers the Acoustic Coupler? Header set Expires "Wed, 15 Apr 2020 20:00:00 GMT" Header set Cache-Control "public"
Who remembers the Acoustic Coupler? A bit of a nostalgia moment. 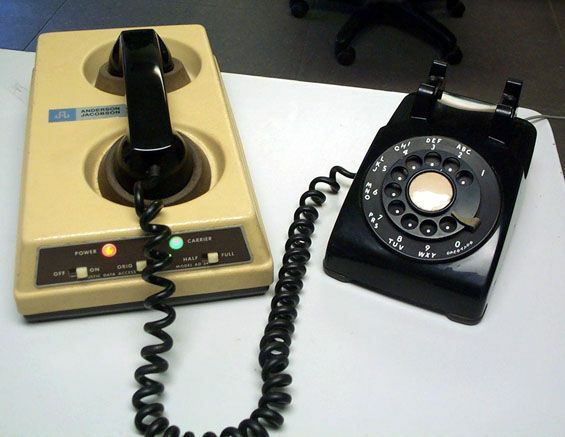 The acoustic coupler was a way to connect your telephone to a data connection. Before the internet was a reality for most of us we were using this to connect to servers and other online services to transfer files and information. Sometimes connecting to bulletin boards, the equivalent of forums now. At 56k it was a very slow and rather unreliable connection. The acoustic coupler had rubber cups for the telephone handset, one for the earpiece and the other for the mike. The sounds it made are much over used in movies every time you see a hacker at work. Needless to say technology has moved on a lot since then. Keeping up with the constant changes is something we have always done since the days of the Acoustic Coupler.